When I arrived at Trinity College 22 years ago, Trinity Hillel was a modest affair – a club for Jewish students with a part-time director and little-used rooms on the edge of campus. Approaching its 50th anniversary, it was nothing to write home about. Now, at 70, it’s a jewel in a couple of crowns, Trinity’s and Hillel International’s. How has this come about? In 2002, thanks to the generosity of alumnus Henry Zachs, it acquired a splendid piece of architecture at the crossroads of student social life. With a kosher kitchen, rooms for religious services, lectures, and classes, a library, and recreational facilities, the Zachs Hillel House had it all. But if a first-rate building is a necessary condition for a first-rate Hillel, it’s not a sufficient one. For that, you need a first-rate director, and since it opened, that’s just what we’ve had. Lisa Kassow brought to the job fluent Hebrew from years working as a news photographer in Israel, programing experience in the Hartford Jewish community, and above all a special gift for working with young people. Thanks to her, Trinity Hillel has become not only a home away from home for Jewish students, but also a place where members of the Trinity community who don’t happen to be Jewish are welcomed with open arms. At the gala celebrating its 70th anniversary in New York City March 27, Trinity President Joanne Berger-Sweeney said that of all the places she visits on campus, nowhere does she feel more at home than at Hillel. Over the years, I have known many non-Jewish students who would say the same. Trinity College has a rich panoply of Jewish resources, from a kosher food station in the student dining hall to a Jewish fraternity, from the liveliest of weekly parshah discussion groups to a Jewish Studies major that offers (among other things) modern and biblical Hebrew, Ron Kiener’s uber-popular course on the Jewish tradition, and world-renowned historian Sam Kassow’s courses on modern Jewish history and the Holocaust. The hub is Trinity Hillel, where Lisa presides. In his remarks at the gala, Hillel President and CEO Eric Fingerhut called her “the single best Hillel professional there is anywhere in the world.” What else is there to say? Prof. Mark R. Silk is founding director of the Leonard E. Greenberg Center for the Study of Religion in Public Life at Trinity College, and chair of the Connecticut Jewish Ledger Editorial Advisory Board. 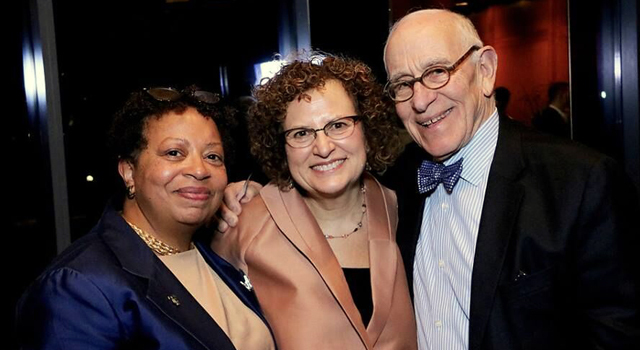 CAP: From left, Trinity President Joanne Berger-Sweeney, Trinity Hillel Director Lisa Kassow, and Henry Zachs ’56, celebrating Trinity Hillel’s 70th Anniversary.